The typical goal in noninferiority testing is to conclude that a new treatment, process, or product is not appreciably worse than some standard (slightly worse is acceptable). This is accomplished by rejecting a one-sided null hypothesis that the new treatment is appreciably worse than the standard. Superiority tests are similar to noninferiority tests in that they are also one-sided tests. However, instead of proving that the new treatment is not appreciably worse than the standard, a superiority test tries to prove that the new treatment is appreciably better than the standard. A two-sided test, called an equivalence test, is designed to show that the test treatment does not differ appreciably from the standard by more than some small, practically unimportant amount. When designing such studies, investigators must precisely define what "appreciably" better, worse, or different means. The acceptable amount by which the new treatment may differ from the standard treatment and still not be considered practically or clinically inferior, superior, or different is called the noninferiority, superiority, or equivalence margin, respectively. PROC POWER can be used to analyze power and determine sample size for tests on means or proportions in one-, two-, and paired-sample cases. PROC FREQ can conduct these tests on proportions in one- and two-sample cases. PROC TTEST can conduct these tests on means in one-, two-, and paired-sample cases. Consider a one-sample test of proportion, p, against a target proportion, p0. The following table summarizes the hypotheses for noninferiority, superiority, and equivalence tests with a given margin, m, the options needed in the ONESAMPLEFREQ statement in PROC POWER to conduct a power analysis, and the BINOMIAL options needed in the TABLE statement of PROC FREQ to perform the noninferiority test. 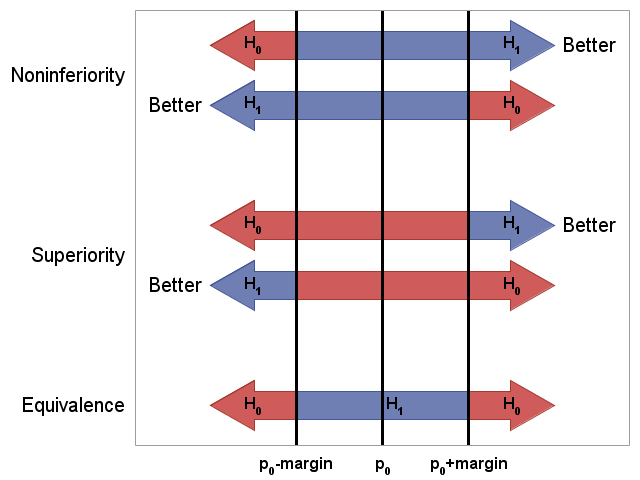 Note that when larger outcomes are more desirable than smaller outcomes, the noninferiority margin defines a rejection region that begins below the target (null hypothesis) value. For situations where smaller outcomes are more desirable, the noninferiority margin defines a rejection region beginning above the target. The opposite is true for superiority tests. The rejection region for an equivalence test lies between the upper and lower margins surrounding the target. You can use PROC POWER to analyze power and determine sample size for a variety of noninferiority tests. Power analyses for noninferiority tests can be performed on means for normal data, geometric means for lognormal data, or proportions for frequency data. Noninferiority tests on means can be conducted in PROC TTEST, and on proportions in PROC FREQ as shown in the following table. The following examples illustrate designing noninferiority studies and conducting noninferiority tests. Further in-depth discussion of noninferiority and equivalence testing, and several examples, can be found in Castelloe and Watts (2015). Suppose a drug under development has a target for the maximum proportion of adverse events of 9%. Clearly, lower proportions are better. You want to design a test to prove that the drug is not appreciably inferior to this target at α=0.05 and with power equal to 0.90. It has been decided that being within 0.01 of the target is not clinically important. where p0=0.09 and the noninferiority margin, m=0.01. Then nullp = 0.09 + 0.01 = 0.10. It is of interest to see the sample sizes required for a range of possible adverse event proportions from 0.05 to 0.85. The following statements compute the sample sizes and plot them for this range of proportions. An equivalent specification uses the MARGIN=m option in addition to the NULLPROPORTION=p0 option as written in the null hypothesis, H0, above. When the proportion of adverse events is 0.05, the results show that a sample size of 239 is needed to conclude that this is not appreciably worse than the target. The required sample size increases quickly as the proportion of adverse events approaches the target. Suppose it is decided that 7% is the likely proportion of adverse events to occur, so 748 subjects are selected for the study. At the end of the study, 48 (6.4%) adverse events were reported. These statements produce the necessary data set for conducting the noninferiority test. 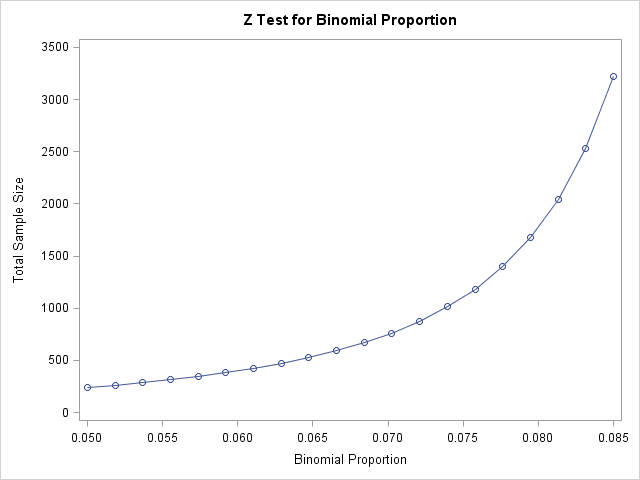 The noninferiority test can be performed using the BINOMIAL option in PROC FREQ. Within the BINOMIAL option, specify the NONINFERIORITY option to request a noninferiority test. Note that PROC FREQ assumes that larger proportions are better, so the test can be performed by testing for a larger proportion experiencing no adverse effects, 1-p. Use the LEVEL="Normal" option to test this proportion. Similarly, the null proportion in the test is now 1-p0=1 - 0.09 = 0.91 and is specified in the P= option. The MARGIN= option specifies the 0.01 margin as in PROC POWER. The VAR=NULL option uses the null proportion to compute the variance as is done in PROC POWER. These statements perform the noninferiority test. The results indicate that the drug is not substantially inferior to the target (p=0.0005). The significance of the test is verified by the lower limit of the 90% confidence interval (0.9178) being greater than the noninferiority limit (0.9 = 0.91 - .01). For studies with two independent samples of normally distributed data, you can use the TWOSAMPLEMEANS statement in PROC POWER to compute the power or sample size needed for a noninferiority test. For example, suppose a new, less expensive treatment is designed to lower blood pressure. Two groups of patients with similar demographics will be randomly assigned to receive either the standard treatment or the new treatment. The mean blood pressure is expected to be 120 in the standard treatment group, and 120 or less under the new treatment. A difference in mean blood pressure of 5 or less is considered clinically unimportant for this comparison. The expected common standard deviation in the groups is 12. You want to determine the required sample size in each group for a range of average blood pressure values under the new treatment in order to conclude that the new treatment is not inferior to the standard at α=0.05 and with power=0.9. where the noninferiority margin, m, is 5. The following statements compute the sample size when mean blood pressure under the new treatment ranges from 110, representing a large improvement in blood pressure, to 122, representing a clinically insignificant worsening of blood pressure. The resulting range in mean treatment difference is 110-120=-10 to 122-120=2. 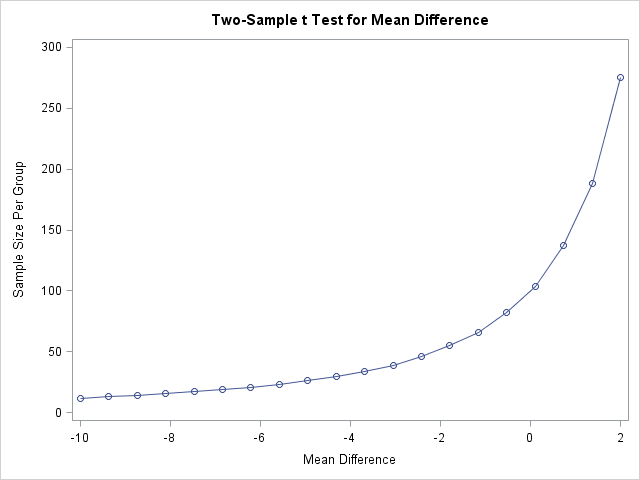 The results show that the required sample size increases quickly when the new treatment mean exceeds the mean of the standard treatment (mean difference = 0). When there is no difference in mean blood pressure, a sample size of 100 is needed in each group to declare that the new treatment is not more than tolerably inferior to the standard treatment. It is decided to assume that the treatment means will be the same, so a study with 100 subjects per treatment group is conducted. The following statements create a data set of the recorded blood pressure readings. PROC TTEST is used to conduct the noninferiority test. These statements produce a lower-sided, 95% confidence interval for the difference in mean blood pressure. If the upper confidence limit is below the noninferiority margin, then the null hypothesis of inferiority is rejected. This upper limit is equivalent to the upper limit of a two-sided, 90% confidence interval. The PLOTS= option produces a graph of the lower-sided confidence interval and includes a vertical reference line at the inferiority margin, 5. The results show an estimated decrease in mean blood pressure of 3.17 under the new treatment. The test rejects inferiority (p<0.0001) with the upper confidence limit well below the noninferiority margin. For studies comparing binomial proportions in two independent samples, you can use the TWOSAMPLEFREQ statement in PROC POWER to compute the power or sample size needed for a noninferiority test based on the score test of Farrington and Manning (1990). For example, in a randomized clinical trial, children with certain type of kidney cancer were included to try to show that chemotherapy (new treatment) is not inferior to radiation therapy (standard treatment). A success response is defined as a reduction in tumor size. The new treatment was considered not to be inferior to the standard treatment if they did not differ by more than a margin of 0.1. If the chemotherapy group is expected to have a success response rate of 0.943 (p2) and the radiation group a success response rate of 0.908 (p1), then what is the sample size required to achieve a power of 0.80 for this noninferiority test? where the noninferiority margin, m, is 0.1. The following statements compute the power for the Farrington-Manning test for noninferiority.Note Note that the proportions specified in the GROUPPROPORTIONS= option are p1 (standard radiation treatment) followed by p2 (new chemotherapy treatment) and that the difference used in the test is p2-p1. Alternatively, you can specify the p2-p1 difference in the PROPORTIONDIFF= option and the p1 proportion in the REFPROPORTION= option. Since larger values of p2-p1 are better, indicating advantage of the new treatment, SIDES=U is specified for an upper-sided test. The results indicate that the required total sample size for the study is 114. That is, if the success rate under chemotherapy exceeds the rate under radiotherapy by 0.943 - 0.908 = 0.035, then 57 subjects are needed in each group to have a 0.8 probability of rejecting inferiority. Suppose the study is conducted and results of treatment are collected from 57 patients in each of the two groups. The following statements record the data. Successful reduction in tumor size is represented by Response = 1. The noninferiority test can be performed using the RISKDIFF option in PROC FREQ. Within the RISKDIFF option, specify the NONINFERIORITY (or NONINF) and METHOD=FM options to request the Farrington-Manning score test for noninferiority. In this example, a larger difference in proportions is better which is consistent with the direction of the noninferiority test provided by PROC FREQ. Since PROC FREQ tests the (p2-p1) difference, while PROC POWER computes (p1-p2), you need to make the new treatment (chemotherapy) the first row of the table and the standard treatment (radiotherapy) the second row. This is done by specifying the chemotherapy data first in the DATA step above and then using the ORDER=DATA option in PROC FREQ to retain that order. The MARGIN= option specifies the 0.1 margin as in PROC POWER. The VAR=NULL option uses the null proportion to compute the variance as is done in PROC POWER. These statements perform the noninferiority test. The results show that the success rate for the new treatment exceeded that of the standard treatment by 0.0351. The noninferiority test results indicate that the new treatment group is not substantially inferior to the control group (p=0.0108). The significance of the test is verified by the lower limit of the 90% confidence interval (-0.0617) being greater than the noninferiority limit (-0.1). Note: The Farrington-Manning test (TEST=FM) is available beginning in SAS 9.4 TS1M2. It is the preferred method for the noninferiority test of two independent proportions. Castelloe, J. and Watts, D. (2015), "Equivalence and Noninferiority Testing Using SAS/STAT® Software," Proceedings of the SAS Global Forum 2015 Conference, Cary, NC: SAS Institute Inc.
Equivalence testing is introduced and PROC POWER is illustrated for determining sample size for noninferiority studies. Noninferiority tests for proportions and means are conducted using PROC FREQ and PROC TTEST.